England captain Alastair Cook will return for Essex in their County Championship opener against Derbyshire. The 29-year-old is named in a strong Essex line-up featuring his England team-mates Ravi Bopara and Monty Panesar. After his century against Middlesex, Matt Prior misses Sussex's trip to Warwickshire with an Achilles injury. Ian Bell will captain the Bears, while Jonathan Trott will play his first competitive game since the Ashes. 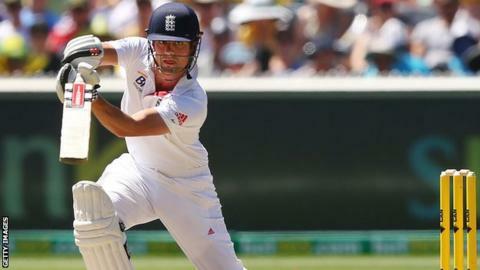 Cook, who has 25 Test centuries, will be hoping to find some form ahead of the summer's first Test against Sri Lanka on June 12 after averaging 24 in the recent Ashes series. Essex head coach Paul Grayson said: "We have a strong side available for this first game and we'll have no excuses. "Cookie [Alastair Cook] and Ravi [Bopara] are both available for the first four weeks and we are really looking forward to getting our Championship season under way." Trott made just eight in a friendly against Oxford MCCU in his first first-class innings since returning from Australia with what was described at the time as a 'stress-related illness'. Earlier this month, the batsman explained his return home by insisting he was "burnt out, but not depressed". Fast bowler Chris Jordan will play for Sussex after missing their opener against Middlesex at the request of England. Middlesex's Eoin Morgan and Yorkshire's Gary Ballance will both be hoping to stake their claim for an England test place as they play Nottinghamshire and Somerset respectively. Durham captain Paul Collingwood begins what may be his last season in professional cricket against Northamptonshire.